Appoint an executor in Thailand: legal assistance and procedures to appoint an executor in Thailand, Pattaya.
. The nomination of an executor is essential to take possession of an inheritance in Thailand. All procedures. and of their decease. Possibly also indicate their last address. - in case the deceased has made a will, you must present it. All documents must be translated in Thai by a qualified or embassy-certified translation agency. * If the deceased has passed away abroad (not in Thailand). the death certificate must be veryfied by the Thai Ministry of Foreign Affairs and by the embassy of the country of the deceased in Thailand or by a Royal Thai Embassy or Royal Thai Consulate in the country of origin. 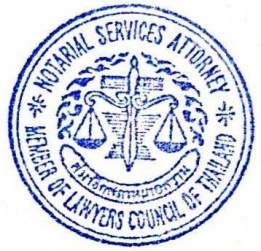 ** The consent of all legit heirs must be given in writing and signed at the precence of a notary public or a consular authority. Should all heirs be in Thailand the consent can be given in writing in Thai language and signed at the presence of a consuar authority, a notary public or two witnesses. The requirements to take possession of an inheritance in Thailand is to obtain a nomination as "Executor" from the competent court and the declaration of "Final sentence". This document, can be requested only 30 days after the first sentence. Note: The certificate of final judgment can be requested from a court that has appointed an administrator for the estate. Typically in court procedures, this letter will be issued one month after the order to appoint an administrator; a time lag is generally set to confirm that no stakeholder has filed an objection to the appointment of an administrator over the estate. * actually the notary public or embassy certification is stricktly required by the court only for the death certificate if the deceased has passed away abroad (not in Thailand) and the consentment of all legit heirs. The "lawyer appointment" can be confirmed by the postulant at the hearing and all other documents can be presented to the court in copies, provided that the originals will be shown to the court at the hearing.